Later this year DC will be launching zero issues this September, but that isn’t the first time the publisher did that. After the Zero Hour crossover ended, the publisher spent October 1994 launching zero issues of established and new titles. They changed some characters and other continuity problems, some changes completely put the book on a new direction. 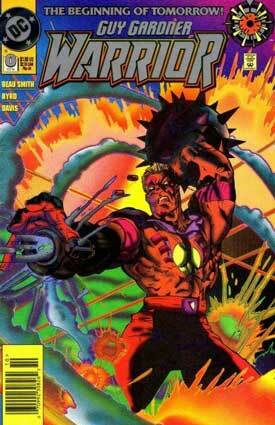 Guy Gardner: Warrior #0 was one of those books. At this point, Guy’s life was pretty miserable. His life had become filled with failure at that point. He had been kicked out of the Green Lantern Corps, lost his Yellow Lantern Ring, had some really odd body armor, and even attempted to be a non powered super hero. And poor Guy didn’t think his life couldn’t get any weirder. Guy finds out that he descends from a race of alien warriors from the planet Vuldar. The benefit of being a Vuldarian/Human hybrid is that he can shape shift his body into all kinds of weapons and other things, kind of like Random from X-Factor. Now having new-found powers and a desire to use them, this revamp of Guy Gardner gave series writer a lot of wiggle room and resulted in some fun comics. Guy got to keep his fun new powers for a few years, until Parallax erased his Vuldarian from his DNA, leaving him just an ordinary human again. That’s one way to erase continuity! This entry was posted in Uncategorized and tagged beau smith, comics, dc, green lantern, green lantern corps, guy gardner, review, zero hour by Chris. Bookmark the permalink.